Wendy Anne’s 100% organic velour paired with 100% organic jersey fabric is the perfect combination for a snuggly Cozy Baby Moses basket that is delicate and natural for baby's skin. Fabric is 100% organic cotton velour & 100% organic cotton jersey, and is machine washable. Made for Cozy Baby Moses Basket. 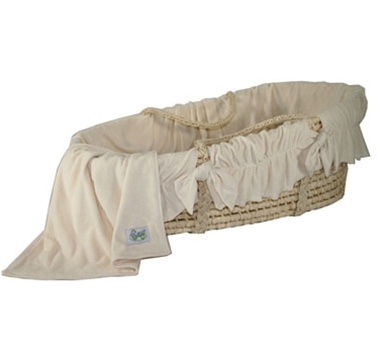 The Moses Basket is designed in mind for parents and caregivers to provide a portable bed with heirloom quality bedding that is just right for those first few months. The Moses Basket should always be put on a stationary wide flat surface and is not to be used as a baby carrier.